So you’ve made a choice board. You value student agency in the classroom, and you’re ready to try this thing. Before you put your board center stage, there are some logistics to consider and details to iron out. This is where Darcy and I come in. A little backstory: I am an instructional coach for BetterLesson and Darcy is a middle school ELA teacher in Alaska. This is the second year that we have worked together, and our shared passion and the focus of our work is supporting students with opportunities for choice using the choice board model. In a previous post: To Shift Or Not To Shift, we shared the beginning of our journey. In this post, we will go backstage and run through the logistics of choice board implementation. We will share the tips and strategies for putting this instructional model into practice so it runs smoothly. We hope that our learnings will support you to create an implementation plan to have ready and waiting in the wings. Julie: Before we talk about implementation logistics, let’s address what goes on the board. How did you decide what to put on it? Darcy: I started by brainstorming what skills or concepts students needed to practice and the assignments I wanted them to complete. Then, I decided how each one could be taught: online via video, a written task card, or via whole group or small group instruction. After that, the board started to come together. Now, I revise the board for assignment variety to appeal to different learning preferences and to ensure student are meeting their learning objectives. I would suggest that teachers start small before trying a full choice board with 6-9 choices: Turn one assignment you would normally present as whole-group into a task card with step-by-step instructions. This makes the first choice board less overwhelming to plan, and it gives students practice with working independently. The brainstorm outlines the goals for the choice board. Sometimes ideas don't make it onto the final board. Julie: What are some tech tools that helped you manage the logistics of using choice boards? Darcy: I am fortunate to have a classroom set of Chromebooks. Last year, I relied on signing up for one of two computer labs in my school once a week which allowed me to successfully use technology in my choice boards; however, having 1:1 devices allows the students more choice because they have access to technology whenever they want it. Here are a list of online tools I frequently use with my choice boards. Each one has the flexibility to be used in different ways and to different extents, so I am purposeful in choosing which ones to use and when to use them. I encourage you to explore them and see how you can apply them in your own classroom. Remember, when I first started choice boards, I only had computer access one day a week and it was still able to work well. Screencast-O-Matic I use this to record notes to give students, put audio clips online, and give oral directions for assignments. It is very handy and easy to use. I pay for a subscription for this, but there is a free account available with limited features. EdPuzzle My favorite feature about EdPuzzle is being able to stop the video (I use it with TED Talks and music videos). I insert comments for students to consider or prompt them that a big idea was just presented. This gives them practice at finding main ideas without me sitting next to them. Canvas This is my school district's Learning Management System (LMS). I use Canvas to organize my class; however, specifically on the choice board, it is used to host our online discussions, links to videos, task cards, and handouts. Google Forms I use this tool to check in with my students after each choice board. The students love to see the pie charts and talk about the results. I will give them statements like: I used my class time. I am feeling more confident with scheduling my assignments. I am following the directions more carefully. I like the choice of assignments, etc. Padlet I typically have students create their own account and submit their Padlet site link via Canvas. They use it as a place to summarize and post big ideas from the content they are reading. I usually have them post three big ideas from the week. This "brainstorming" can be used in a summative assessment at the end of units. Julie: What steps did you take to launch your choice board? Darcy: The big picture is that choice boards are front-loaded. That means you have to put in a lot time to prepare all of the assignments before the students begin their work. When I launched my first choice board, it was four weeks long, running three days a week. Because students chose the order in which they do their assignments, I had to have everything ready to go on day one. I remember employing my daughter over the weekend to help staple, sort, and stock everything the students would need the following Monday. I have launched choice boards without having everything prepared--some task cards not written and handouts unavailable--and I ran into students trying to do the assignments without the directions or searching for the handouts they need. It's best to have it all ready to go. Long before choice boards came along, my students were doing most of their classwork in composition notebooks. Because of this, I didn't have to plan where students would track their progress and keep their work; assignments would go in their notebooks. Some choice boards will have assignments that are outside of their notebooks, but because their board and calendar is glued in their notebooks, they always know where to look on their choice board workdays and they have the board to cross off assignments as they go. On the launch day, every student is given a printout of the choice board and a calendar of choice board workdays. If I only have access to computers one day a week, I schedule their online activities for them on that day. For students who have a hard time scheduling their assignments, I do a couple of things. If there is no small group assignment on the board, I can have a pre-planned calendar with all of the assignments already scheduled. When students DO have to sign up for a time in a small group, I find it's easier to help them plan their calendar one-on-one. In my experience, if a pre-planned schedule is offered, most students will want it because it tells them what to do. 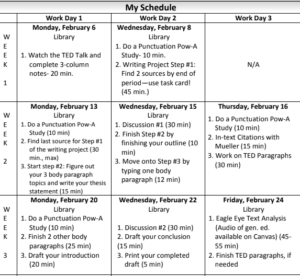 It isn't a bad thing, but one of the skills I try to teach is time management and having students plan their own work. The calendar is organized with the choice board workdays students will have. The pre-planned calendar has all of their activities scheduled for them. After passing out the board and the calendar, I give a quick overview of the assignments and then set a timer for students to plan their work. Know that the students will need guidance in planning with their first few choice boards. I give one or two calendar examples and let them know they can break assignments up over multiple days, consider the assignment's media type, whether an assignment needs to be done earlier in the choice board, or to notice the pre-planned activities that may cut into their work time. It's at this point they may all be melting in their seats with expressions I only see when their brains are on overload. Don't panic; your students will get it. I often have my students break the calendar up into smaller chunks of one or two weeks. That allows them to evaluate their use of class time and progress when they revisit their calendar to plan the rest of their assignments. I require students to fill out the calendar for the first few choice boards of the year, after that, I let them self-evaluate whether they need it or not, but no matter what, they have to have it glued in their composition notebooks. Julie: How does the choice board fit into the weekly schedule? What does a week in your class look like? Darcy: After students have had opportunities to practice week-long choice boards, I prefer to run them three days a week, typically on a Monday, Wednesday, and Friday for up to four weeks. On the other weekdays, I teach skills students will encounter on the choice boards or run another thread of curriculum concurrently. I also reserve the first few minutes of class for a whole-group bell-ringer activity, like grammar study, vocabulary practice, or quick writes. There's incredible flexibility with the scheduling. It really depends on your objectives, the number of assignments on the board, and estimated time to complete everything. Darcy: One of my questions for Julie when starting this process was, what do I do with students who finish the choice board early? Julie: When you asked me this question, I encouraged us both to take a step back and re-focus on the outcome for our work, which was to support students with opportunities for choice. 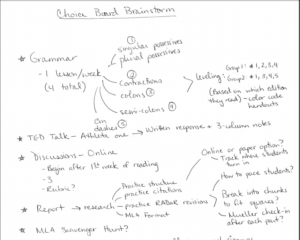 I suggested that we look at the choice board’s instructional design first in order to determine if we could differentiate the choices to embed extension within the model. For some of the choices on the board, we included three texts (a mild, medium, and spicy) option, which leveled the texts, while also providing the option to read more than one text. If students finish early, there are additional tasks within their choices to explore. I also suggested Genius Hour, a strategy where students could choose a topic they were passionate about, conduct research, and share their findings. This strategy was connected to our outcome because students would make a choice around their topic. Make sure students have practiced following multi-step directions independently and scheduling their own work--start with a single day and build to a multi-day choice board. The choices are activities and assignments students have the skills to do, and have done before in your class. Have options for students if they finish the choice board work early. Be patient and flexible--when trying a new board, know that there will be hiccups: some directions might be unclear on the task cards, the network for your internet may go down, or even time estimations may be off and you have to alter dates. Be purposeful with the type of assignments on the choice board. Are they a mix of off-line and online activities? Mostly one or the other? Does there need to be a teacher-led station? Establish how students will track their progress. My students have a printout of the choice board and update a Google Spreadsheet once a week with their progress; the online tracking was added later in the year. Have a system in place so students stay organized. They need to have a copy of the choice board, their calendar, and a place to keep their work. This could be done with composition books, individual folders, or their school binder with a dedicated section. This may all seem like a lot--the curtain hides a lot of time, planning, preparation and maybe even frustration at times. Be transparent with your students that you are trying something new, and that you may make changes along the way. Be patient with yourself, and trust the process. Slowly, your classroom will progress from rough rehearsals into an amazing performance with students spotlighted at center stage. In our next post, we will write about classroom management and choice boards, and how to engage students and support them as they work through the board.